You take your life in your hands when you cross the Makona River. Winding through Guinea, Liberia and Sierra Leone, the river is deep, wide and long. I’ve made it across, in the dugout canoes that ferry passengers back and forth over the borders and it’s scary. Up to ten people squeezed in, alongside sacks of flour, rice, palm oil, handicrafts, and other goods. No life jackets. For women entrepreneurs in these three countries, such risks are their livelihood. It’s a tough trade. On each of the market days within traveling distance of the river border the women leave their homes early in the morning. 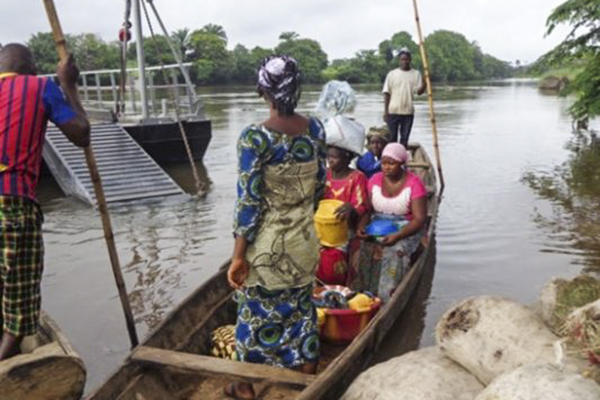 To get their market goods over they may have to cross the river multiple times, before loading up a truck, ready for a long, rough road journey. Sometimes the journey is too long to return home by nightfall. Despite such obstacles, these women are an economically important group, they make up 70 percent of Sierra Leone’s cross-border traders. Yet, it’s hard for them to access to business development and financial services that could help them assess and reach potentially profitable markets. Many are barely literate, or not at all, and they also lack business and technical skills. I work in the Secretariat of the Mano River Union (MRU) – an international association bringing together representatives from Côte d’Ivoire, Guinea, Liberia, and Sierra Leone, with the aim of accelerating economic growth, social progress, and cultural advancement. Another, a more far-reaching benefit is that the collaboration between the MRU women traders and their colleagues in Tanzania and Kenya has led to more countries taking part in South-South and triangular cooperation (where a developed country or multilateral organization supports cooperation programmes and projects). Ms. Nyaibor Ngombu has over 20 years’ experience in Programme Management and is currently the Senior Programme Officer responsible for Health, Gender and Capacity Building at the Mano River Union (MRU) Secretariat with a background in Public Health and Public Administration.